It is the week of the 4th of July, if you've been an IHAN blog follower for a few years, you know what that means! Our annual pilgrimage to Wyalusing, PA.
How many UFO's are too many? I think I have enough UFO's to last me until I'm 200 years old. Perhaps it is time to get realistic and either finish them or hope a "magic sewing Genie" ends up in my Christmas stocking! Hope you are having a wonderful weekend and all is well with you and yours! Have you started using Bloglovin? So far, it has been easy....for me....that's new! I noticed The Quick Ripper recently and decided to give it a whirl. 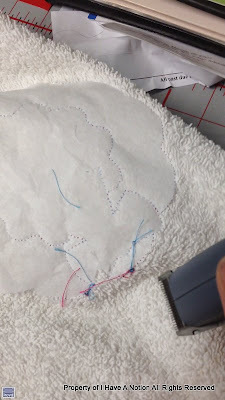 You know I am in love with my Famore Seam Rip but I wondered if The Quick Ripper would be handy for taking off all those small threads on the back of my machine embroidery. Any idea how difficult it is to hold an I-Phone in one hand and use The Quick Ripper with the other hand? Suffice to say, it was a bit of a trick. I was able to take those small threads off by keeping The Quick Ripper parallel to the piece. The threads were shaved off in a jiffy. It also removes seams and serger threads. The teeth on The Quick Trimmer and very fine and it catches the threads very well. The AA battery is included as well as a small brush to clean out the teeth. If you were hoping it would remove Machine Embroidery Stitches on the front of a design like I did, well, it doesn't do that....darn! How is that for getting back to work? Yesterday was an "average" day in my life. The co-workers and I had to go to get some groceries last evening. We went to Meijer, a large, we have everything type of store. The co-workers were begging to go to the electronic department first (and if you can believe it, they also ask if they can go there and be alone while I shop!!! They are 9 & 10...NOT!) I decided to get their mind off of the electronics department I'd haphazardly walk through the book and magazine section. The magazine section at Meijer on Central Ave in Sylvania, OH. There are titles above the magazines as you can see....."Men's Interest,"
"Women's Interests." Silently I asked myself, Really? This is 2013....and there are still labels for people's interests? And....who are the "Special Interest" people? Typically I experience myself as a human being first, before I think about weather I'm male or female.......so I "guess" I'm glad someone else it thinking about what I'd like given I'm a female. While the co-workers were thumbing through things about Star Wars, I flipped open "Quilt Life" by Alex and Ricky to see what is going on since I've been away from my normal quilting world. You know I cracked up laughing when I opened to this page, "The Perfect Play"...Fabric, Football....and Jerry Joins the Quilt Life. Perhaps Meijer's needs to know that there are men that love quilts and quilting, sewing, thread work and plenty of women who are body builders and those that really know about computers...or at least this has been my experience. That is my average day....what is your's like? Feels Like It's Been Years! Can't believe it has been so long since I wrote a blog post. I'm slowly returning to myself after the passing of my mother. We just had her "Celebration of Life" gathering this past Saturday. Trying to get everything in order for that has kept me more than occupied. This was one of the photos used for the announcement for her gathering.....I just love this photo. It has been a few months since I took this next photo, but I am still tickled by these girls so I wanted to share my post and a link to their website. These gals were at Checker Distributor picking up some fun fabrics when I saw them. Naturally I asked to take their photograph. Check out their tops, they have designed and made their own tops. How smart is that? What a perfect way to use some of those "oh so fun" prints out there on the market. Today I went looking for their website and noticed it says they are on vacation until July 1. Kids Fly Too is a website that carries a handmade line by KPea Original if you want to check out other things they have. I'm hoping to have the energy to do some blog hopping and catching up. Have you seen anything out there in blogland that you think I missed? Please leave a comment and let me know about it.....I'm so far behind. Congratulations Barb and a huge thank you to Julia Woods and Peggy Rhodes for allowing me to participate in this blog hop. If you are wondering why I cut such a variety of fabrics to send along with the book....I would if I were you...LOL.....I make all of mine out of scraps and love the variety of colors and themes on the fabrics. If you are not the winner, you can purchase an autographed copy of Quick and Easy Hexie Quilts HERE. Oh and don't forget, Julie is giving away a Go Baby on her blog and you have 4 chances to win. Click HERE to find out how. Quick and Easy Hexie Quilts, REALLY....and a Giveaway too! You may be thinking....quick and easy....where have I heard that before? It is true, I'm here to tell you.....it is possible to turn a circle into a hexagon and you won't have to use a paper template. How do I know? I have recently reviewed a copy of Dr. Peggy Rhodes and Julia Wood's new book, Quick & Easy Hexie Quilts and I've made my own hexagons (shown above on top of the book). These hexies are much larger than the hexagons I've been making for the past 8 years. Mine are approximately 3/4" across and I've been using paper to stabilize my work. I have to say, I really have enjoyed making the larger hexagons without paper using Dr. Rhodes and Julia Wood's method. The "Florabunda Table Topper" is one of my favorite patterns from Quick & Easy Hexie Quilts. Will ya just look at all those beautiful colors......they are beautiful! Light, dark, print, dots, stripe, solid or floral....all of them make incredibly beautiful Hexie Quilts. Would you like to make Quick and Easy Hexies too? For your chance to win your very own copy of Quick and Easy Hexie Quilts please leave a comment on this post telling me what you love about hexagons. The winner from the IHAN blog will also receive 50 pre-cut circles.....oh just think of the fun you will have! 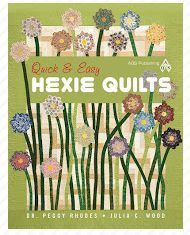 There are several chances to win a copy of Quick & Easy Hexie Quilts. Visit each of the blogs below and leave a comment to increase your chances of winning. 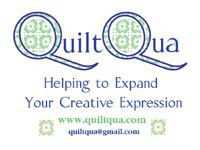 One winner from each blog will be chosen on June 10th, 2013 to receive a copy of Quick & Easy Hexie Quilts. 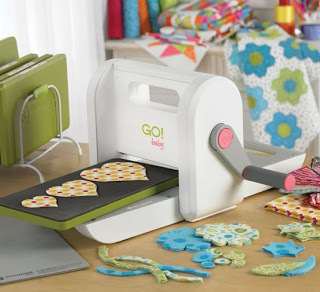 Be sure to visit Julia Wood's blogs (see links below) before June 10 for a chance to win an Accuquilt Go Baby fabric cutter as well. Thank you for visiting and best of luck to you! On May 19th my younger brother, Mathew, graduated from Law School. This in and of itself is a huge accomplishment....but during the boring commencement speech (I was tempted to stand up and scream "Time Out....you are boring and we want to see our family members get their diplomas now"....but I didn't.) I sat thinking about his life. He has served in the Army, gotten a bachelor degree in plastic engineering, a masters degree in business and now a law degree. It sounds like he has spent his life studying but no.....he has traveled the world and had two children as well....my little brother is one amazing dude and it sort of just dawned on me....LOL! Speaking of amazing dudes.....my oldest co-worker shot 5 bulls-eyes on the BB gun range. We were only given 5 BB's....I was lucky to hit the paper one time. A week or so ago, we had another cub scout event. Our very first car race at the Toledo Speedway. It was pretty neat to see that the racers pulled their cars near the stands and let the fans get autographs. The youngest co-worker was thrilled to be having soda and candy....he loves sugar and his boss does her best to set limits on that stuff! I felt a bit stupid because I had to ask the man in front of me if the car races were real or if they were like big time wrestling. What planet am I from? I do know about the Daytona 500 and the Grand Prix....but who knew there were people who race cars locally? Please forgive my ignorance! You are looking at a photo of men following one another around in circles....yes....spending money on gas to drive in circles....not to fabric stores....but in circles following one another and going nowhere! When they were finished and got their trophy they then did it again....this time with boats in tow. REALLY? I could not make this up....I'm not that creative....giggles. It gets a wee bit more interesting when they then drive in a figure 8 in a bus....until each one is smashed to smithereens and can no longer run. Forgive the quality of the photo...but this a lovely lavender brushed cotton with hand embroidery and hand quilting. I'd like to tell you that I made this lovely quilt....but that would be a lie. I purchased it at an estate sale last Friday and I paid $55. I could not buy the fabric and thread for that price. I also purchased a beautiful quilt with churn-dash quilt made with feed sacks....I'll have to take a pix of that one to show you. Now....that is something I can get excited about and perhaps run in circles....but pay for gas to drive in a circle....not me....still giggling at my narrow life. Between thread, fabric and sewing....life does happen here at IHAN headquarters. While sitting at Max and Ermas having dinner one evening, Aaron looks at me and asks me, "Momma, why do they call these napkins....we don't take naps on them? We should call them lapkins because they sit on your lap." I guess the apple doesn't fall far from the tree....still laughing. One of my girlfriends lost her husband so I ran home for the funeral this past weekend. PA is one of the most beautiful places I've ever been in my life.....it was overcast and ye the sky and mountains were still just as beautiful. After the funeral, we gathered at their home and our group put on a lovely lunch. You know I loved pulling into her driveway....there was a barn and a barn quilt....my idea of home! Another quilt! Hooray :) This is Eleanor's tie quilt....it isn't quite finished but I just had to take a pix. Appliqued silk ties one silk dupioni. I now know what I want to do with some of my father's ties. My spirits have been lifted by my quilting friends yet again.....stitching friends have kept me from falling apart....I guess they just know what they are doing! Oops...I left off a photo....the co-workers last day of school is today....it is officially summer here in Ohio. Are You A Hexie Lover? If you are like me and want a copy of the book immediately, Julia will autograph a copy for you and you can find her HERE.